Hello & welcome to this weeks blog. In my last blog, I promised I would share our first impressions of Singapore following our initial arrival. I’ve also included some of the lessons we learnt too. Hopefully this doesn’t disappoint and you find it useful and informative. Happy reading. 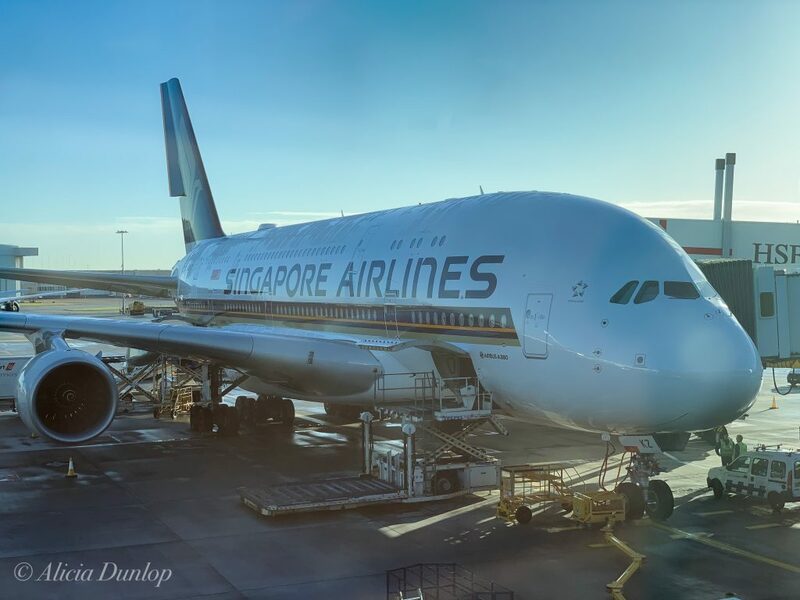 For our flight to Singapore we flew with Singapore Airlines aboard an Airbus A380. The iPhone photo below is the actual plane we travelled in. We had never been on a plane this big for for this long – 800 passengers for 13 hours. The inflight entertainment was excellent. I caught up on some of the recent cinema releases that I’d wanted to see but hadn’t had time to see back home. Even in economy class we had touch screen technology and I was able to plug in my own noise cancelling headphones. A point to note: Free headphones were offered for everyone to use. So don’t feel you have to pack your own if weight is an issue. Blankets and pillows were also provided for everyone. A nice touch, although due to a lack of space, they did get in the way at times. The crew on the flight were excellent. They ensured we stayed well hydrated & fed. Nothing was too much trouble. It is easy to see why they are the world’s best airline. I would certainly vote for them. On our flight from London, we were not given a Disembarkation /Embarkation Card to complete for Singapore Immigration. Naively we didn’t think too much about it as we queued with our passports – just like others from our flight. Point to Note: The Disembarkation / Embarkation cards have to be completed by all visitors before passing through immigration. We were politely turned away to complete the form and rejoin the queue. If you are not given a card on the flight, you can pick one up just before you progress to immigration control. You’ll probably see lots of people gathered on either side of the hall filling them in. We pre-booked the city shuttle bus from the UK before arriving in Singapore. For S$9 each it was a bargain. We pre-booked our pick up for an hour after our arrival to ensure we made it to the check in desk in plenty of time. The driver took us straight to the door of our hotel. The only thing I would say was that we arrived 15 minutes before our scheduled departure but we were not picked up until 9:30am – an hour later than the time we booked. The journey then took an hour as we were the last people dropped off. Whilst we were not on a strict timeline, it resulted in me not trusting their schedule. I was happier paying S$30 for a taxi when we needed to catch our next flight. I knew what I was getting, when and where. So when I next return to Singapore, I will simply hop in a taxi as it takes all the stress away from wondering where the heck the city shuttle bus is! If you are on a tight budget & time is not a problem, you can find out more about the service offered & pre-book your shuttle here. In the UK we always talk about the weather. The reason is because it is so changeable. In the winter, it can be bright & sunny one day with a hard crunchy frost. The next it can be snowing. In the summer one day it can be 27ºC with beautiful clear blue skies, the next 20ºC & raining. Occasionally hailstones will thunder to the ground. Here in Singapore it is basically hot & humid. The sky seemed to have a bright layer of cloud that filled it. 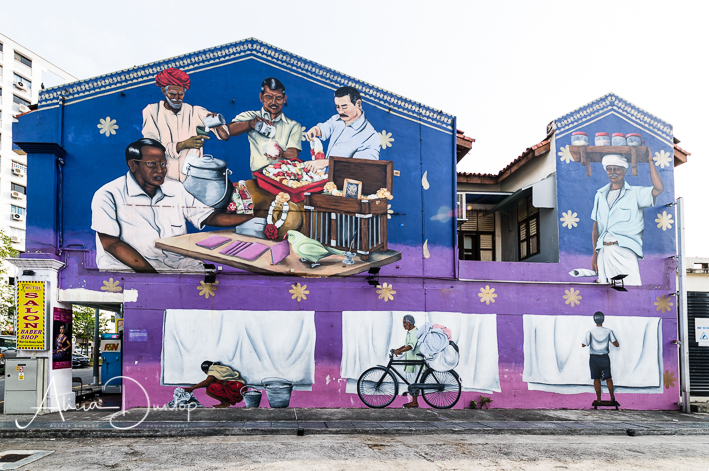 The image below of the mural in Little India gives you an idea. The sky really was a very bright, light grey for the first couple of days we were in Singapore. Typically, January is one of the wettest months of the year here. We didn’t experience the rain, but during our stay in Singapore it was hot & humid – 30ºC & 70% humidity. Having travelled from the UK where we had a sharp frost & snow was forecast for the following week, to stepping out of the airport on to the bus, where the heat hits you like a wall. It was a bit of a shock to the system. The humidity leaves you feeling constantly sticky. To be honest, it may as well have rained! Having never experienced this before, and at the risk of sounding rather melodramatic, I quickly realised we were in danger of dehydrating due to the amount of fluid we were losing through our skin – even though we thought we drank plenty of fluid – water and soft drinks. We felt pretty rubbish until we drank some isotonic drinks. So the best advice I can give you is drink plenty of water & top up with an isotonic drink to give your body that little extra energy & to rebalance your body’s fluid & minerals. The MRT (Mass Rapid Transport – Singapore’s underground system) became a good friend. The first 2 days we were in Singapore we walked everywhere. Then as the heat and humidity began to drain us, we opted for the MRT. With a prepaid travel card, single trips were very cheap. On average they are less than S$1. It is more expensive to buy a single ticket and, dependant on where you are travelling to, can cost up to S$2.40. You can find out the cost of the fares using the calculator on the Singapore Transport website. Personally I found the MRT mobile app really useful. It provided all the key information I needed for getting from A to B including the fare. Knowing the cost of the trip before hand is useful when you have a pre-paid travel card as it will give you an idea of when you need to top up the card. A key thing to note is that the minimum top up value is S$10. It is worth noting that you can use the same prepaid travel card for the buses too. Just make sure your card has the NETS logo & the same logo is displayed on the bus you are looking to catch. During our 4 day visit, we used the MRT to get to & from Chinatown, Little India, Singapore Zoo, Sentosa Island, & Gardens by the Bay. The card & 1 top up cost us S$20 each. After a 13 hour flight & travelling across 8 time zones, I expected to suffer with jet lag. I was unable to sleep on the flight – I was so excited to be at the start of this amazing journey. After years of saving and planning it was finally a few short hours away. So for 4 days I functioned on 2.5 hours sleep a night. This was after full days of sight seeing & general tourist activities during the day. 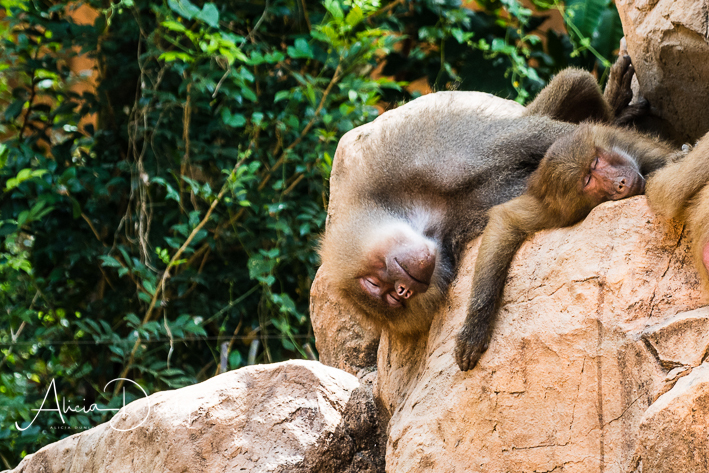 What I will say is that for those 2.5 hours I slept like a log… Just like these baboons! Had the sun shone brightly the first few days after our arrival it would have made our recovery that little easier & quicker. So my advice is that if you can bear the humidity, walk as much as possible in the outdoors on your first few days. Just remember to drink as much fluid as possible – avoid alcohol (as tempting as it might be). You may find this article useful for possible ways to beat jet lag. When we first left the airport the thing that struck me the most (after the heat) was how manicured and clean everything was. The central reservation that separated either side of the road was landscaped with everything being mirror imaged – plants, colours and shapes. There was no litter. It really is a sight to see in todays world. Thankfully the government here has ensured that the history and heritage of the areas has been maintained. 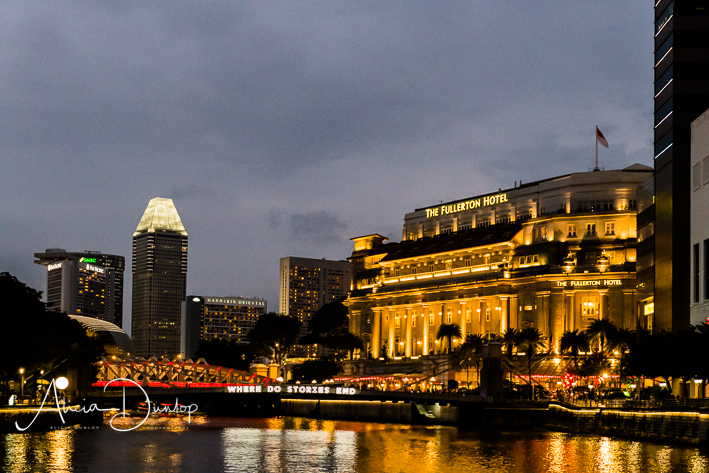 The image above shows The Fullerton Hotel (almost 100 years old) with the recent high rises of the past 20 years or so. Whilst Singapore must have lost much during the development boom of the 90’s and 00’s, you can still see low rise and high rise buildings standing together across the city. The image below is of the edge of Chinatown seen through an office block ‘underpass’. 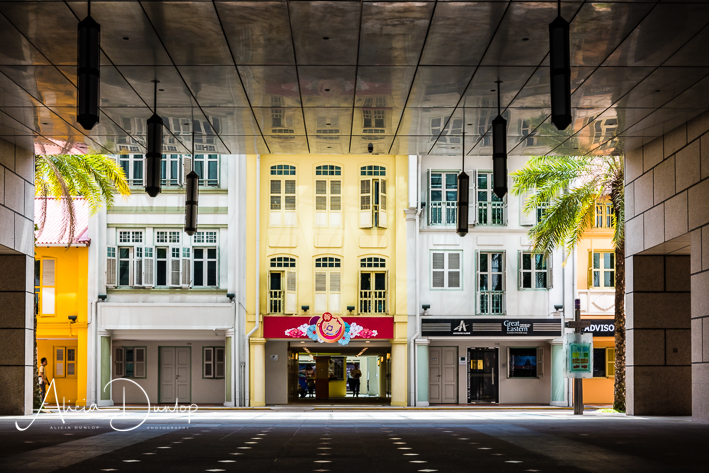 To see these areas & the heritage close up make sure you visit Little India, Kampong Glam and Chinatown. They are so vibrant and ooze culture they must not be missed. 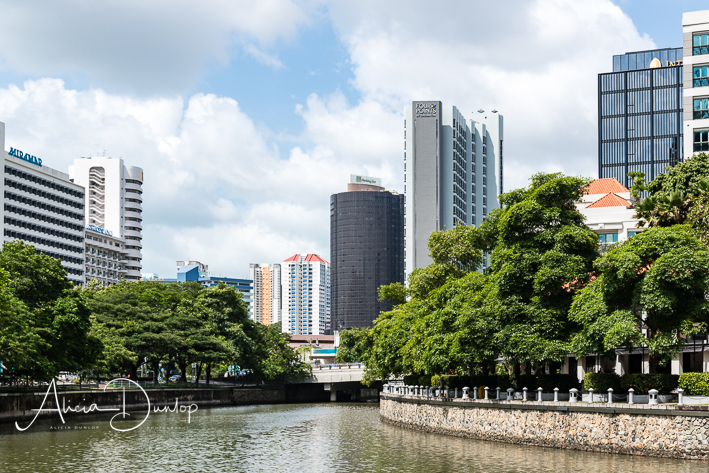 I hope you have enjoyed this weeks blog about our first impressions of Singapore. Next time I’ll tell you a little about the area we in stayed and the sights we visited during our time in Singapore.